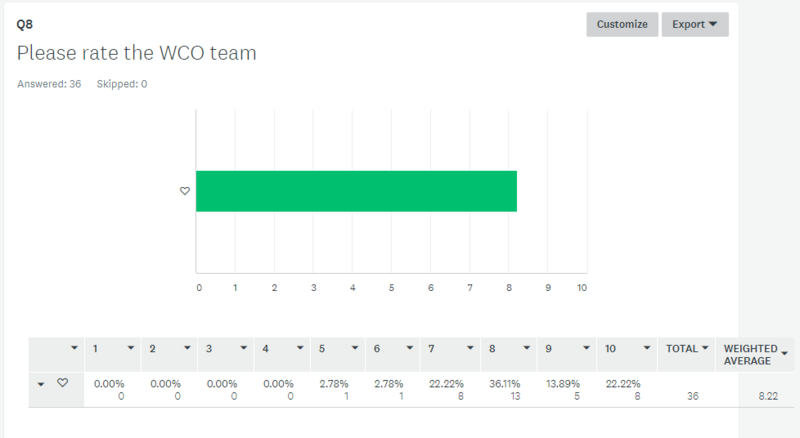 As promised, the survey that ended two days ago, is now being reported back to the community. First of all, a big thank you to the 36 participants that took a few minutes of their time to fill in the survey. It is much appreciated and also necessary in order for the WCO team to find out about potential improvements, outside occasional discussions with individual members. The average time to fill in the survey was 7 minutes, this average includes a few entries from over an hour (presumably people who were multitasking). We will start off with the multiple choice questions. 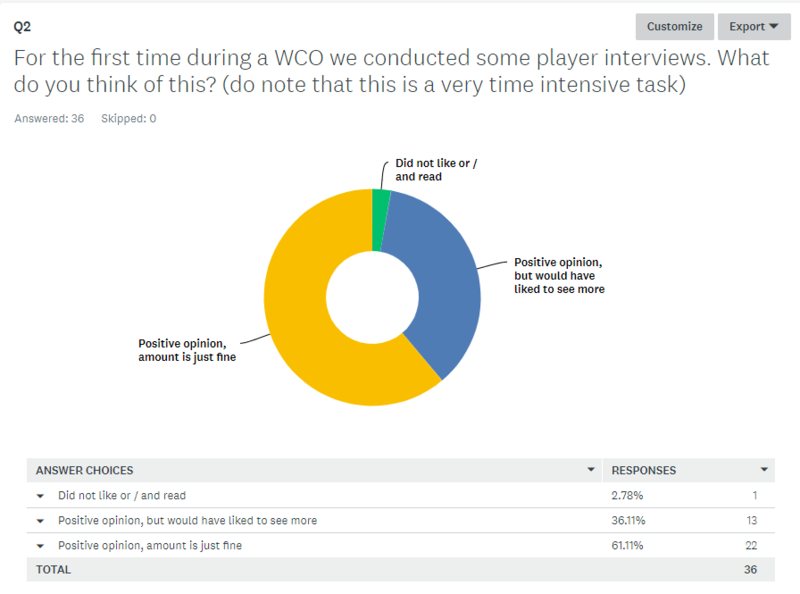 It seems that the player interviews were very well received. Some would have liked to see more, but overall the opinion seems favorable towards community related events such as interviews. 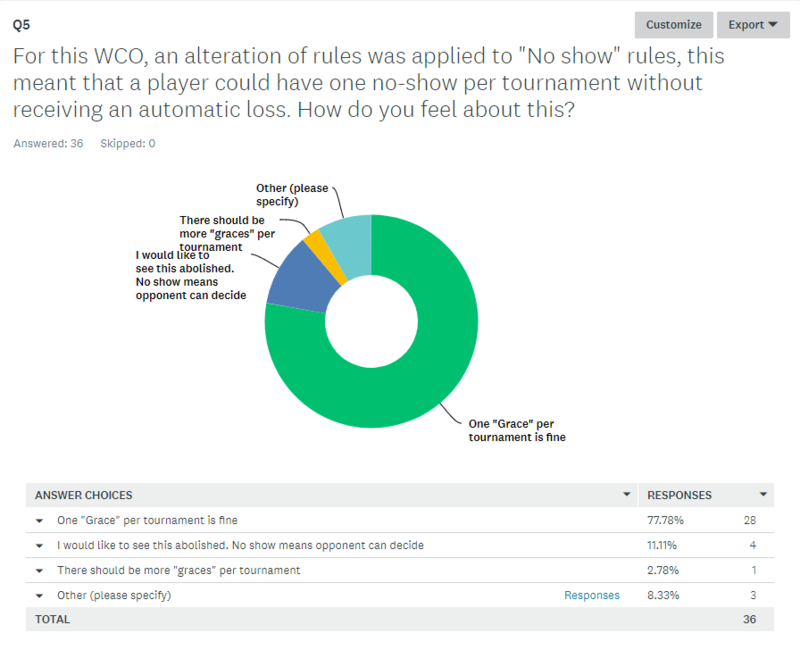 A very large majority seems to be in favor of allowing one grace “no show” per tournament. Some suggestions like only a grace in the first week will be taken into consideration too. 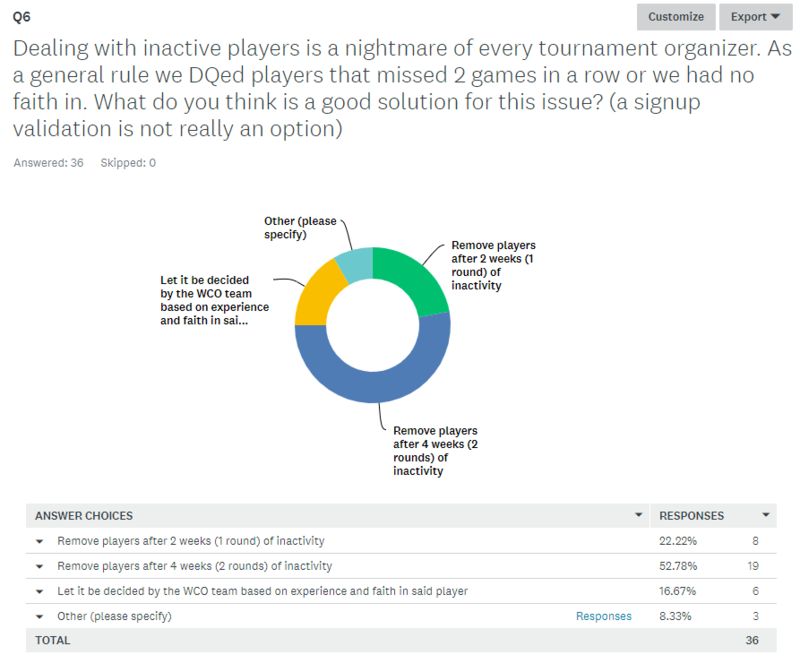 Just slightly more than 50% prefers that a player is removed after missing out on two rounds in a row. A fair amount preferred that this is done after one round immediately, while some others prefer this to be judged by the WCO team. We will discuss this internally on how to tackle this issue better for next WCO. 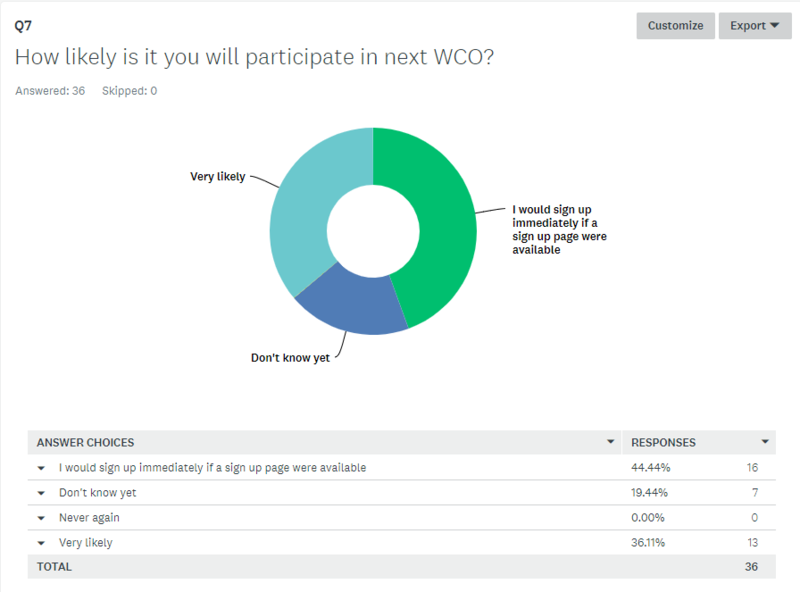 The overall perception of those who filled in the survey about the WCO team are very positive. The 8.22 weighted average is much appreciated! 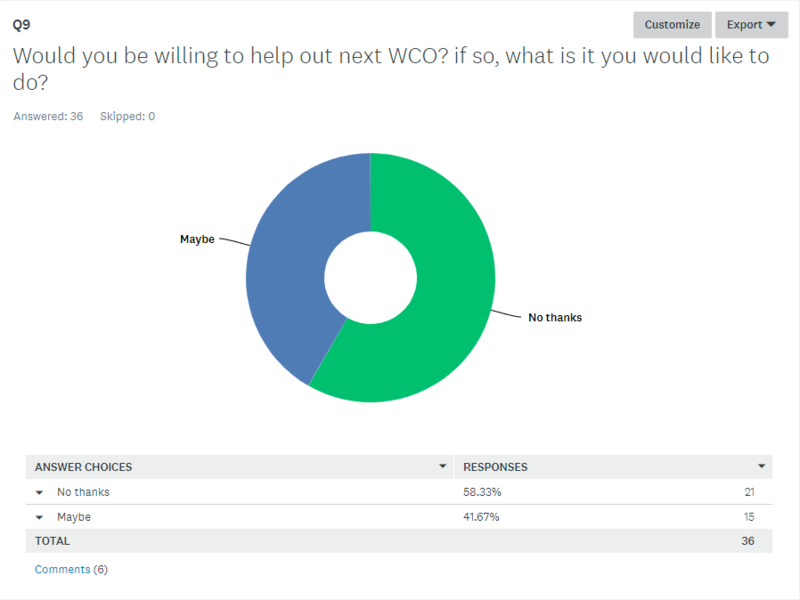 Quite a fair amount of players are willing / considering to help out for next WCO. Thanks! Alias register. This also has been mentioned several times outside the survey. Nothing makes it stand out relative to the other tournaments. Committee position was fair in difficult situations. WCO team was active all the time and replied quickly to all messages. Clarification on decisions / log (unplayed games / DQ). Automatically authorizing players to post videos of WCO game(s). Last but not least, two players did not like the extension granted in round 4 due to site issues. The WCO Team will discuss the feedback given by the community and hopefully be able to improve some part of the WCO rules & organization. Thanks and see you next year!